actually indomi is so yummmyyy i love it !! it helps me survive the hunger when i am not into home food ! mazboot lemon goes well .. bardo tomato sauce .. soy sauce as well .. bas mushkilto ma bishabbi3 .. u get hungry soon after ..
.. i have to say this ... all this noodles are very fatening .. its not the right choice ..!! Seriously!! Hiye wa2afat 3al Andomi ya3ni!! Now THAT is cool. 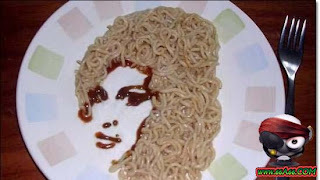 Food art! I like it.